The Shoppers Drug Mart Tuesday text offer has arrived a little bit late today, but you still have plenty of time to take advantage of this offer, valid Tuesday, February the 26th only. 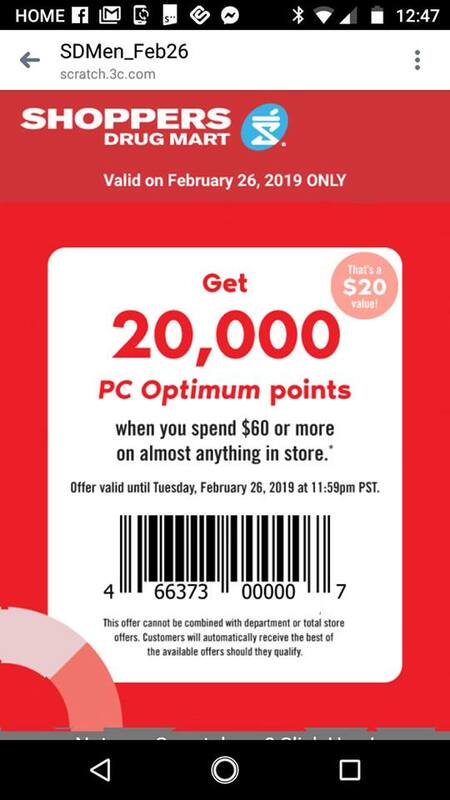 Get 20,000 PC Optimum points when you spend $60 or more on nearly anything in the store. To use the offer you can first scan your PC Optimum card, followed by the bar code from either the text you received, or from the screenshot of the offer above. The 20,000 points will appear on your receipt and in your account immediately at the end of the transaction. Check your PC Optimum account for an offer valid tomorrow only at Beauty Boutique online. Redeem $100 worth of points and get up to $140 off. Select accounts have received this offer.